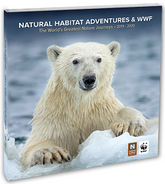 Thank you for requesting our catalog of The World’s Greatest Nature Journeys! Together, Natural Habitat Adventures and World Wildlife Fund have teamed up to arrange nearly a hundred nature travel experiences around the planet, while helping to protect the spectacular places we visit and their wild inhabitants. Because we personalize each package mailed from our office with specific information to meet your individual needs, we require that you include a correct daytime or evening phone number or a correct email address. Thanks!